Omsaga Hotel is a 10-minute drive to Central Festival Shopping Center. 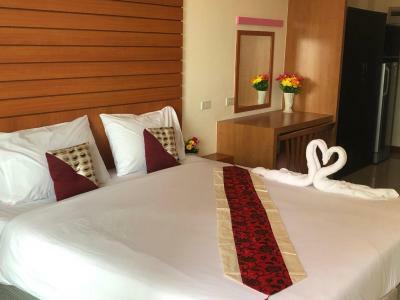 The hotel offers modern air-conditioned rooms with free WiFi. The property is a 30-minute drive from Phuket International Airport. 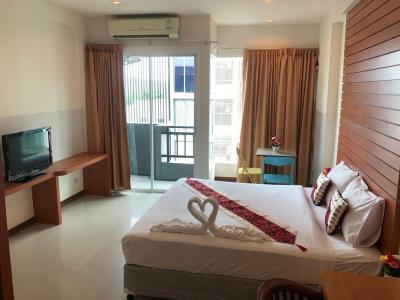 Furnished with stylish décor, each room at Omsaga Hotel features a private balcony, a TV and a refrigerator. Shower facilities and a bathrobe are included in an private bathroom. The hotel is equipped with a 24-hour front desk where staff can assist guests with different requests. For convenience, the hotel provides laundry services and free private parking. There are plenty of local restaurants located nearby the hotel. When would you like to stay at Omsaga Hotel? Air-conditioned rooms feature a private balcony, a TV and a refrigerator. Shower facilities and a bathrobe are included in an private bathroom. Air-conditioned rooms feature a private balcony, a TV and a refrigerator. A bathtub is included in an private bathroom. Suite is consisted of of two bedrooms and two bathrooms. Air-conditioned rooms feature a private balcony, a TV and a refrigerator. House Rules Omsaga Hotel takes special requests – add in the next step! Omsaga Hotel accepts these cards and reserves the right to temporarily hold an amount prior to arrival. The location is terrible, the hotel is dirty. This is not s 4 stars hotel, it shouldn’t be qualified as a hotel. No accept credit card payment.